Traveling to Phi Phi Island, the one from the movie "The Beach"
The best season for visiting Phi Phi Island is from November to the end of March, since there are few rainy days and the weather is dry. During the high season you can swim at practically all the beaches on Phi Phi Don; but when the monsoons arrive the waves are very high, and not being protected, swimming can become dangerous. Sadly, these days Phi Phi Island is no longer as “uncontaminated” a destination as it was 20 years ago. After the tsunami of 2004 in fact, the Thai government has unsuccessfully tried to bring back the island’s magical atmosphere. The construction of imposing hotels and building speculation has heavily ruined the island, especially on the Tonsai isthmus, which faces the twin beaches of Tonsai and Loh Dalam. Nevertheless, the island (particularly the eastern part, which was less affected by the tsunami) still offers beautiful places where you can find wild nature that’s almost untouched. Consider too that there are few automobiles on the island and there are just a few forms of transport in circulation such as motorbikes and scooters. If you’re traveling to Southeast Asia and wish to visit Phi Phi Island, my advice is to stay for at least a few days. From Phuket there are several organized toursthat will allow you the chance to visit Phi Phi Island for about 4 hours. I sincerely don’t recommend this type of excursion for the simple fact that you’ll spend more time on the catamaran than enjoying the island and its beaches. The island doesn’t have an airport, so the only way to get there is by sea. So it’s best to take a direct flight to Phuket or Krabi and then from there take a ferry for the port of Phi Phi Island. From the main port of Phuket (Rassada Pier) there are 4 connections a day headed to the port at Tonsai, the first leaves at 8:30 a.m. and the last at 3:00 p.m.
From Krabi too there are various options for getting to Phi Phi Island by ferry. Departure times go from 9:00 a.m. to 4:00 p.m.
You can also get to the island by ferry from other local places like Koh Ngai, Koh Mook, and Koh Lanta. 12go.asia: on this portal you can not only buy ferry tickets, but also buses, minivans, taxis (run by private companies for long trips), and trains. PhuketFerry.com: a site where you can book ferry tickets for many Thai destinations. Andaman Wave Master: is perhaps the most famous company for buying ferry tickets and also tours to Phi Phi Island, such as snorkeling in Maya Bay. If you’re looking for the busy life and wild parties every night, then look for a hotel in Tonsai. The price range varies greatly depending on the season, but in general you can count on a double room costing from 400 THB a night. Hostels also offer low prices. The Lucky Dorm for example, offers beds for 150 THB. You also need to consider that up until October it’s the low season; when the dry season starts hostel prices can go up to even 1,000 THB a person. For those that prefer calm and tranquility instead, I recommend going to the hotels that line the eastern shore, on beaches like Long Beach or Laem Thong Beach. Among the most appealing resorts is the Phi Phi Long Beach Resort & Villa; Villa, a gorgeous hotel with a pool that directly faces Long Beach. The price for a double room per night starts at 3,500 THB. At Laem Thong Beach there’s the hotel that could possibly be considered as the most beautiful on the island: the Zeavola Resort. A complex of 5 star luxury bungalows, you can fully enjoy nature and the nearby beach. A suite starts at 7,000 THB. Another exclusive resort also located on the eastern shore is Villa 360. This hotel is completely immersed in the green and located right on the water. Prices for rooms start at 6,000 THB a night. Click here to take a look at the best hotels on Phi Phi Island. The best places to eat are concentrated for the most part in the village of Tonsai. There’s a great variety of cuisines: Thai, Italian, Indian, and even Creole. Prices are higher than on the mainland, and seem to continually rise. In the resorts and hotels outside of the center, there are always local restaurants where they usually serve both Thai food and international dishes. The most famous beaches of Phi Phi Don are Tonsai (where there’s also the port), and its twin Loh Dalam Beach. Since Tonsai Beach hosts the island’s port, it’s also the most visited by tourists. The water isn’t anything special due to all the boats and ferries that continue to dock at the port. There are various hotels in Tonsai, along with Thai restaurants and simple bars where you can drink from a coconut right on the beach. Personally I don’t recommend staying in Tonsai, since you won’t see anything of the true beauty of Phi Phi Island. Between the two beaches of Tonsai and Loh Dalam is the only village on the island, called Tonsai Village or Phi Phi Don Village. The town is really small and in an hour you can see it all. There’s practically nothing to see; in the middle of town there are hotels, restaurants, shops, laundromats, tourist agencies, and pubs that stay open very late. The center is also walkable, you won’t see any cars on the island aside from the hotel minivans or pick-ups for restocking bars and restaurants. If you really want to enjoy the island and don’t want to spend your vacation in chaos, I really don’t recommend getting a guest house or hotel in this part of Phi Phi Island. Sadly its twin Loh Dalam also doesn’t have a spectacular beach, nor clearer or cleaner water. This is mainly due to the fact that when ferries full of tourists arrive from nearby islands, the majority of them head to this beach. In addition, when the tide is low, you’ll have to walk for kilometers before being able to swim. In the northeastern part of the island, begin the climb to the most beautiful beaches starting from Long Beach and end up at splendid Laem Thong Beach. Long Beach is not far from the port of Tonsai, and in fact many day tours offer boat service to reach Long Beach in a few minutes right from the port. You can also get to this beach on foot, following the path that starts from the port for about half an hour. In reality Long Beach is a group of small beaches, all with white sands surrounded by palms. I recommend this beach for those looking to get out of the chaos of Tonsai and Loh Dalam Beach, and find a little more tranquility while staying near to the center of town. If instead you want absolute tranquility and came to Thailand to taste the true essence of nature, then the east coast is for you. Going up from Long Beach you’ll find Loh Moo Dee Beach, one of the least visited beaches in all of Phi Phi Island. This paradise can be reached in a fifteen minute walk from Long Beach, or in just a few minutes by having one of the many boats docked at Long Beach take you, the so-called longtail boats (those long wooden boats where passengers sit single file). Moving on we then find Ran Tee Bay, a scarcely visited beach where there’s only three hotels and two restaurants. You can get there with a longtail from the port of Tonsai. Another beautiful beach on the eastern coast is Loh Bakao Beach. The sands are white and the sea is crystalline. The only downside of this beach is that, like Loh Dalam Beach, when it’s low tide it’s almost impossible to swim. It’s a beach that’s very suitable for families with children, since it’s very calm and not at all dangerous. The beach considered the most beautiful in all of Phi Phi island is Laem Thong Beach, the northernmost beach on the island. At Laem Thong Beach you’ll find a long beach formed with white sand and crystal clear waters. It’s not frequented by backpackers, and the hotels on this beach are mid to upper range, like the Zaevola Resort. From the port of Tonsai it will take a half hour by boat to get to this beach. If you’re already somewhere around it, like at Loh Bakao Beach, you can follow a paved path in a little less than an hour on foot and reach Laem Thong Beach. Other smaller and less-visited beaches are: Ao Toh Ko (east), Pak Nam (east), Loh Lanna Bay (north-east), Monkey Beach (northwest area). On Phi Phi Leh you can also see white beaches and crystalline water. Among the most well known are Phile, Loh Samah, and the very famous Maya Bay. Maya Bay can be easily reached by boat. The best time to visit it is early in the morning when the hordes of tourists haven’t yet gotten to the island. The beach is very beautiful and the water a crystal blue; all around the bay is a breathtaking natural panorama of rocks and trees that create an honest to goodness jungle. It’s not possible to stay at Maya Bay or on Phi Phi Leh in general, since there are no hotels, in fact the island is not inhabited. You can however camp at Maya Bay, but only if accompanied on a tour. Since 2005 in fact, the Thai authorities had prohibited camping in view of the degradation that it caused. But ten years ago the option of camping was reintroduced on the condition of being part of a guided tour. Even though the main activity is the beach, on Phi Phi Island you can also try snorkeling, diving, and climbing. You can also fish, do yoga on the beach at the Mama Beach Residence hotel, choose a marijuana massage at the P.P. Massage Centre, take a Thai cooking course at the Pom Cooking School of Tonsai, and even go up to the highest point of the island to admire the stupendous landscape. Among the aquatic activities, snorkeling is one of the most popular among tourists who step ashore. All you need to get is a mask, snorkel and if you want to swim faster, some fins and you’re all set! The best places for admiring the fish are Long Beach, Maya Bay (you can also encounter a large variety of animals such as octopus), Monkey Bay (where you can also admire the coral), and Moo Dee Bay. Besides these locations, you can rent a boat and move around the nearby islands such as Mosquito Island. Challed Koh Yung in Thai, Mosquito Island offers a wonderful barrier reef as well as lots of varieties of fish. There are various agencies that organize this tour, and often this type of tour also includes a visit to nearby Bamboo Island. For experts there’s also the option of going diving. 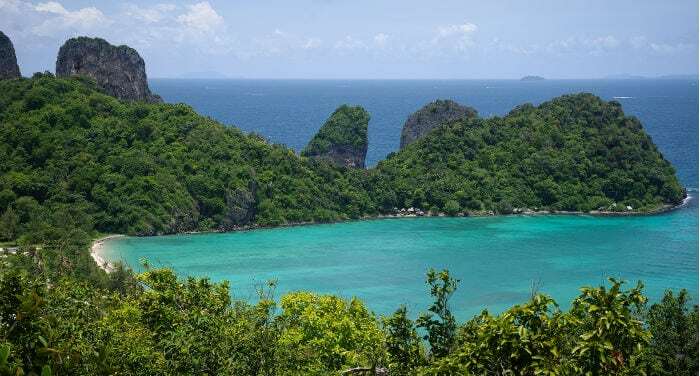 About 30 minutes from Phi Phi Island, more precisely an area called Garang Heng, you can dive and enjoy the coral reef and if you’re fortunate you might even see a leopard shark (which are completely harmless to humans). Other areas famous for diving are Hin Dot (fifteen minutes away from Tonsai by boat), Hin Pae (closer still: just 10 minutes from Tonsai), King Cruiser Wreck (an area of the sea that’s 30 meters deep, where the wreck of a Japanese catamaran built in the 70’s sank after hitting a coral reef), Maya Bay, and Hin Bida (the farthest of all: 1 hour by boat from Tonsai). Other than water activities, Phi Phi Island offers entertainment for those who also love rock climbing. In places like Tonsai Tower (200 meters high), Drinking Wall, Hin Tak, Ao Pilay Wall, and even Maya Bay, you can climb safely. Among the most famous climbing schools on the island there’s Spider Monkey and Deaf Gecko Rock Climbing. Keep in mind that on Phi Phi Island there aren’t any hospitals. If something should happen to you or you need medical care, the closest hospital is on Phuket. You’ll also want to consider the need to take out a health insurance policy before coming to Thailand on vacation. As far as local currency goes (Bath, THB) there are various banks and ATMs available in the center of Tonsai. You can also pay by credit card at the majority of hotels and restaurants.